With her career taking her to London, New York, Munich and Dubai, Ella Rabener is as well-versed in geography as she is in finance, online marketing and building start-ups from the ground up. After 15 years of management consulting in a variety of sectors, Ella now runs her fintech start-up Scalable Capital. Between meetings, panels, events and promoting STEM fields to girls, she might not have much time to unwind, but the inspiring entrepreneur found time to share with us her knowledge of fintech and smarter investments. Tell us about your career journey – how did you come to your current role? I started my career in management consulting at McKinsey & Company almost 15 years ago. I used that time to gain a lot of exposure to different geographies and sectors – I worked in Munich, New York, Dubai and London, and travelled pretty much all over the globe for my clients. I started in the Risk Management Practice, working primarily with financial sector clients for the first two years, and then spent the last six years focusing on retail, consumer goods and fashion clients. I left at the end of 2009 to start my career as a start-up entrepreneur. I’ve co-founded three projects so far and I’m now a co-founder in the London office of Scalable Capital, a digital wealth manager that’s launching in the UK in July. We’ve been live in Germany since January and the business is really taking off. 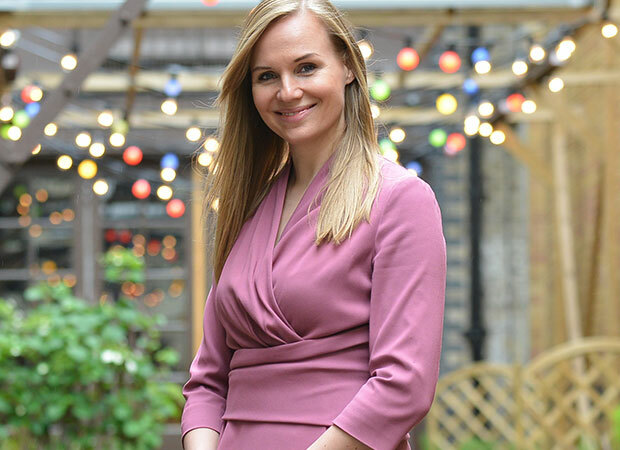 My current role allows me to combine the skill set I’ve acquired so far – I understand finance and the capital markets, but also have years of experience in online marketing and building start-ups from the ground up. I oversee all of our global marketing and PR efforts. Let’s discuss fintech – what is it? It’s the umbrella term for financial technology firms, so basically start-ups that are looking to disrupt the way we do banking, get insurance or invest our money. Scalable Capital is aiming to give busy professionals access to a professionally managed capital markets portfolio to help them build their wealth for retirement. It’s a service that in the past was reserved to the very wealthy, since traditional, offline wealth managers only accept clients with at least £800,000 to invest. We bring that minimum investment amount down to just £10,000 and also give our clients the benefit of using modern technology to manage their portfolios in a more intelligent, personalised way. It’s really about taking the stress and the cost out of investing and make it more transparent. We’re just one example of many fintech companies trying to do a better job than banks or asset managers – and be cheaper at the same time. What are the biggest mistakes people tend to make when it comes to managing their personal finances? The biggest mistake is not investing your money at all, but leaving it in your bank account where it can’t grow and earn interest for you. It’s astonishing how many people don’t realise that inflation actually makes them lose money, in real terms, by doing that. They also don’t benefit from tax advantages and often don’t discipline themselves to grow their retirement pot by setting up a savings plan that is linked to an investment portfolio. However, even those that do invest often make one – or several – of the following three typical mistakes: they don’t diversify enough, they try to time the market, or they forget about the impact of high fund fees. We’re trying to help clients “behave better” by making sure they are very broadly diversified across asset classes, industry sectors and geographies. We’re also adjusting their portfolios dynamically based on changes in the current risk level of financial markets, and we’re charging much lower fees than traditional fund managers. Every half a percent of fees has a significant impact on your wealth accumulation over time. Going back to the word ‘disruptor’ – we hear a lot about tech companies shaking things up in traditional sectors. Do you consider Scalable a disruptor? Absolutely. We’re using technology not just to provide our clients with a clean, easy-to-understand sign-up process and a great app to track their portfolio performance, but we also use technology to invest their money in a smarter way. Cloud computing has caused a sharp drop in the cost of computational power – this means even though it’s data intensive and requires thousands of simulations of a portfolio’s future paths, we can run risk projections for each client portfolio every single day. This process helps us identify if a client’s portfolio is still in line with her selected risk category, and if it isn’t, we can automatically adjust it to bring it back on track. If the portfolio is too risky, for example, we will substitute higher-risk asset classes such as equities with lower-risk asset classes like bonds, or the other way around if the portfolio allocation is too conservative. This risk-management technology was previously only used by investment banks for large institutional clients like pension funds or sovereign wealth funds. We make it accessible for regular retail investors at a fraction of the cost – that is indeed a very disruptive service. We aim to use it to give our clients a portfolio that always stays in line with their risk tolerance, instead of fluctuating directly in line with market conditions. We’re the first ones to offer such an investment methodology for regular retail investors. You’re from Germany. What brought you to London and do you have plans to open offices elsewhere? Our founding team consists of Brits, Germans and Austrians, so we wanted to be European from the start. London is the financial capital of Europe and a great place to attract top talent, so it was an obvious choice. We’re currently live in Germany and have an office in Munich, too, and we plan to start marketing our services in Austria in the next couple of weeks as well. We can scale our service quite easily and since we can “passport” our licenses to other EU countries from the Financial Conduct Authority here in London, as well as from Germany’s regulator BaFin, we will continue to expand within Europe. It’s too early to tell if or when we’ll expand beyond Europe, but the growth prospects are very exciting. We’re going to start fundraising at the end of the year again, so one objective is to make all that happen successfully. One of my personal goals is to get more involved in making girls aware of the opportunities they have when they choose a career in the STEM subjects (so science, technology, engineering and maths). When I was still at McKinsey, I was part of a group interviewing new candidates for quite some time and I realised that the reason we had way less than 50% female consultants was simply that only about 20% of the applications came from women. The same is now true for Scalable Capital – only one of our ten software engineers is female. If I can help raise awareness of how interesting and rewarding – and not just financially –careers in those domains can be, I would find that a very worthwhile way to spend my free time. When it comes to free time, how do you switch off? Or do you prefer to stay switched on? I have to admit that I currently don’t have that much time to unwind, but during my time off I like to travel, ideally combining a round trip with three or four days at the beach. On the weekends I love exploring London’s latest photography and design exhibitions. In the summer I might also get a bit lazy and simply hang out in a deck chair in Regent’s Park with a good book and the sound of happy people around me. Going back to the topic of work: who has inspired you the most in your career? I couldn’t really point to one particular person, but I always find it very inspiring to read or hear the stories of entrepreneurs that had to fight for their success, such as Sir James Dyson. There are so many stories in the press that make it sound like a walk in the park – all you need is a garage and a ping pong table, it seems – but the truth is that the majority of entrepreneurs face set-backs and disappointments before they reach a break-through. It’s very inspiring to see the perseverance of the people that have made it, and how they learned from their failures and mistakes. How important is what you wear in your role? Since we’ve ramped up our PR activities in the UK I have been asked to participate as a speaker or panel member at an increasing number of events. As a representative of a wealth management firm, I need a wardrobe that instils confidence in people that we are capable of managing their money. After all, we’re talking about tens of thousands and sometimes even a few hundred thousand pounds for many of them. We’re a modern, tech-driven firm, but I don’t think that translates into the need to be wearing a hoodie. It just doesn’t feel right for the sector we’re in, and I personally still believe that well-tailored clothes made of great fabrics simply make you look your very best. Who wouldn’t want that? And finally, what’s your favourite piece in the Fold summer collection? I love the Belleville top. It’s very chic and ticks all the right boxes – well-tailored, flattering and clean, but with an interesting twist. I’m a huge fan of virtually all your dresses and already looking forward to the new collection coming in.